As this has been a common query on mailing lists and twitter, so I thought I should do a short piece on the feature. 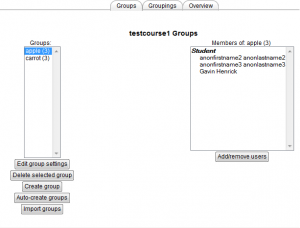 This short article shows the process for setting up activities which are locked to group members only; that is, I will create two activities but each will be locked to two different sets of students and in this example we will use a forum. With Visible groups each group member works in their own group, but can also see other groups work. With Separate groups each group member can only see their own group, and the others are invisible. In both options using the forum settings and this means that the users communicate in the same forum activity(same link on the page) but in different threads. However, this means it is the same forum description and link. But sometimes you want to have each doing something different (perhaps if it is 2 different project discussions). This is where groupings come in. A grouping is a group of groups. 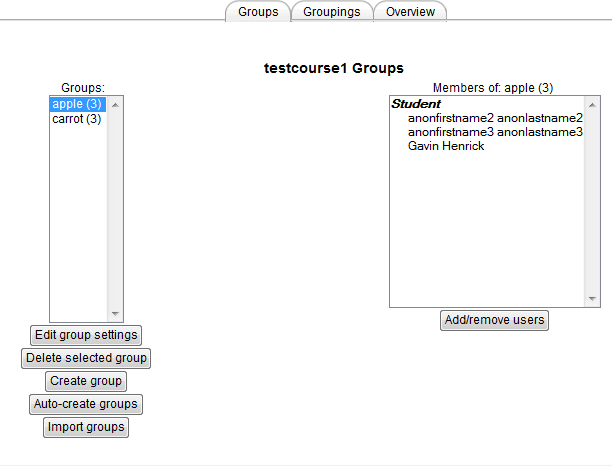 So in this example, firstly I created two groups of students. I called one of them apple and the other one carrot and placed three students into each. I placed my student account into the apple group. Next, once the groups were created, I created two groupings and placed one group into each. As mentioned earlier a grouping is a collection of groups, so it could have more than one in it, I am just using one in this example. So I created a grouping called FRUIT and put the apples group into it. Then I created a grouping called VEG and put the carrot group into it. So now the course part is ready to start using creating the activities, but before I create the forums, there was another setting I had to enable, this is called Enable Group members only. This is found in the Settings block > Site Administration > Development > Experimental Settings. I needed to tick the Enable group members only setting and save. With that done, I could go back to the course. 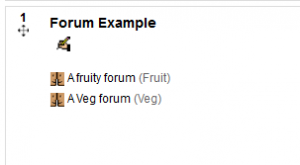 So in the first topic of the course I started to create the first forum, and lock it to the Fruit grouping. 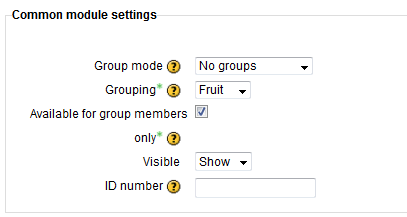 Under the Common module settings I chose selected the correct grouping Fruit and ticked the box to lock to group members only as in the image below. Then I repeated the same with a forum for the Veg grouping. Each forum has the grouping name after it in brackets. But what about the student view? In my different browser, I had myself logged in as a student. The student was in the apple group (image above) and therefore the FRUIT grouping, so it can only see the fruit forum. There are no brackets with grouping name after the activity, and the student is unaware of any other activity existing. So that is it. That is the process for setting up two different activities for different groups of students so that they are only aware of the one they are supposed to use. 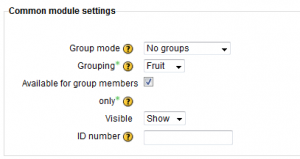 You need to enable the experimental setting Enable group members only to get the options in Common Module Settings. 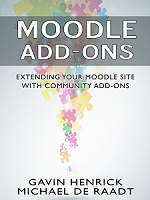 SchoolsICT has also recently posted on how to their product Zilink integrates with Moodle on groups and groupings. The cohorts, groups and grouping are auto-created using their custom Schools MIS integration.